Staff who wish to raise their students understanding of key words and terminology in an interactive, competitive manner. TVA is looking at raising the literacy levels of all students and I have chosen to work with students who have learning and language difficulties. 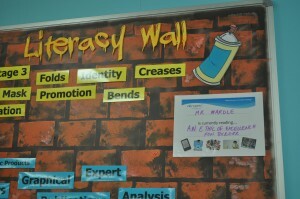 I also wanted to make literacy work for me and be something that students saw as 'cool'. This would be essential to their progress and success. 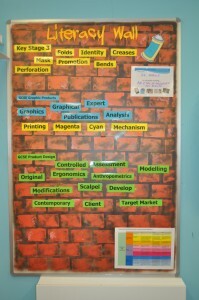 The plan was to convert an old whiteboard/notice board into a wall of learning: brick texture and larger than life! So I used acrylics, plaster and a sponge to create the wall. The title and iconography were made out of colour printed foam board for impact and the words used were printed onto colour coded, laminated card. To allow the words to be removed and used by students the key terminology had velcro attached. This meant that students were able to chose, remove and assemble phrases and sentences. I have used this literacy wall with KS3 – 5 and it is currently working extremely well. Students have played 'What am I?' games with the wall, used words for sentence construction and have added words that they feel are important to their progress. In fact all the words and terms are pupil driven and they have a responsibility to write down and research new words. To take the idea across other subject areas in the school. Work alongside the 'Creativity and Innovation group' (CIG) to help support the development of 'Inspiration stations' (interactive displays) and to update subject Top trumps with new key words.